Nine years ago, the UK was facing a general election dominated by the issue of immigration, but with barely any migrant voices to be heard. At the same time, a new movement was starting – first in ad hoc meetings in cafes across London, then eventually with an office, a name and a website. And so Migrant Voice was born. The goal? To empower migrants to speak out and be heard. And since Migrant Voice was (and still is) migrant led, the motto became, “Speaking for ourselves”. Nine years on and the political climate is arguably even more hostile – and our goal even more important. But looking back at the last 12 months, and ahead into our 10th year, we’re full of hope that change is possible. Along with our regular network meetings, Media Labs and drop-in sessions, we've been part of some great initiatives in the last year and had some great media coverage that foregrounds migrant voices. Many of these projects would not be possible without our crew of talented and eager volunteers - so a big thanks to them. In the West Midlands, we've joined the exciting new MiFriendly Cities project, working alongside 10 partners (including three local authorities, universities, a major employer, and other NGOs) to find new ways to make sure migrants and refugees are fully included in the life of the region and - along with all others in the community - can use their skills and talents for the benefit of everyone. In Glasgow, we ran a photography project on the theme of integration and belonging culminating in an exhibition at the Glasgow Centre for Contemporary Arts – and more recently welcomed 30 new volunteers to the MV team, many of them migrants, as part of a new project. Down in London, we ran a similar photography project, with the photographs created by our members exhibited in the gallery at The Guardian newspaper. The three regions pulled out all the stops in December with a nationwide video and social media campaign for International Migrants Day, celebrating the friendships created due to migration. Who is your #MigrantFriend?, we asked. The answers were heartfelt and heart-warming. As Brexit nears, we’ve been working closely with groups such as the New Europeans, The 3 Million, JCWI and Eastern European Resource Centre to fight for the rights of EU nationals in the UK and challenging the government directly when those rights appear threatened. We’ve been lobbying the government too on the issue of the thousands of international students wrongly accused of cheating on an English test by the Home Office in 2014 and living in limbo ever since. Working with many of the students affected, we produced a report and launched it at Parliament, helped secure a parliamentary debate, launched a petition and crowdfunding page, and just last month held a demonstration and event at Westminster. As we enter our 10th year, our numbers strengthened and energy renewed by an expansion with new staff members in London and the West Midlands, our eyes are fixed firmly on the road ahead. 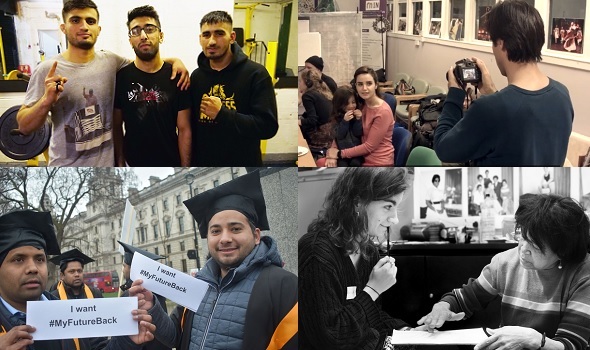 We’ll soon be kicking off a video project on the theme of integration and belonging, funded through our new partnership with MoneyGram, and getting stuck in with phase two of our “Meet a Migrant” project. And along with our regular network meetings and Media Labs, we’ll be continuing to fight for the rights of EU nationals and stepping up our campaign for justice for the international students whose lives were destroyed by the Home Office. The Windrush scandal, while horrifying us all, showed that compassion and natural justice can win out when there are people willing to give a platform to migrants and push for what is right. That’s what we’ll be continuing to do this year, with the hope and belief that migrant voices – when spoken loudly enough and reaching all corners of this land – have the power to effect the change our society needs.